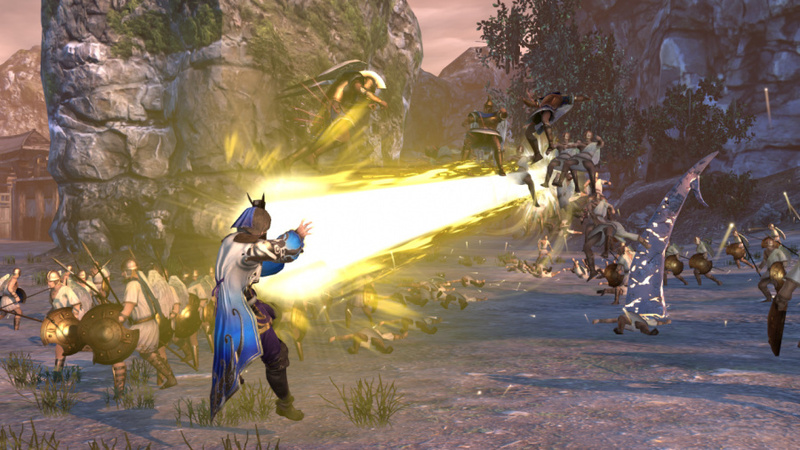 Developer Omega Force’s hack and slash Warriors games have become a genre in themselves with a fiercely dedicated following and more spin-offs than you’ve had hot dinners. Versions with famous properties – including One Piece, Gundam and Dragon Quest, to name a few – have helped widen the audience but Nintendo gamers will probably be most familiar with Hyrule Warriors and Fire Emblem Warriors. 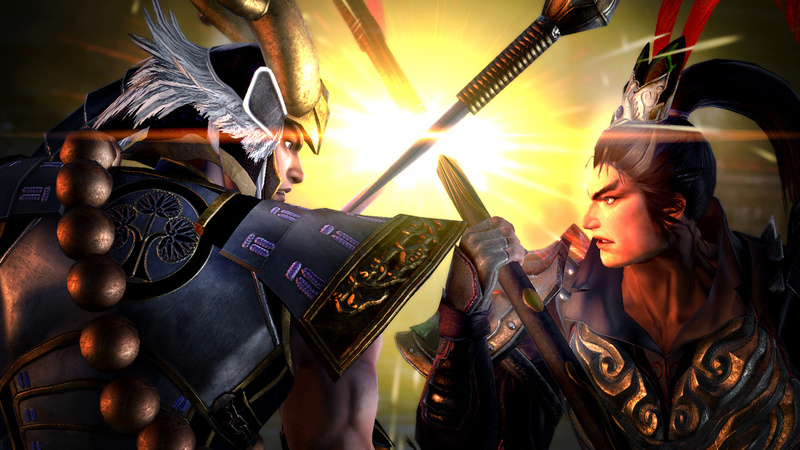 A rift in space-time or some such nonsense once again brings together characters from Dynasty Warriors – the series that started it all – and its sister series, Samurai Warriors. These stablemates are also joined by the pantheon of Greek and Norse gods in the kind of crossover that makes Infinity War look like an episode of ‘70s Doctor Who. We could sit down and map out the convoluted route it’s taken to get here, discuss Serpent Kings and agonise over numbering discrepancies between East and West but, frankly, it’s best to take Basil Exposition’s advice – we’re here to hack and slash. And say what you like about the series, Warriors Orochi 4 certainly provides on that front. You run onto the battlefield as one of a three-man party which you cycle between with ‘ZL’ and ‘ZR’. Large armies litter the map and you must sweep between them, capturing and defending bases, all the while moving in the general direction of a boss as your hit counter climbs to eleventy-stupid. ‘Y’ executes basic attacks and switching between characters immediately following a charge attack (‘X’) produces a cyclone which swirls enemies together for easy hits. This, in turn, fills your Musou gauge enabling you to press ‘A’ and watch the camera twist round as your fighter winds up for a powerful Musou Attack. Magic moves are activated by pressing any of the attacking face buttons while holding ‘R’. Higher ranked enemies such as Base Captains can be locked onto by clicking the right stick, but your common-or-garden variety baddies swarm around and the camera isn’t particularly helpful when they flank you. Mounts are available by pressing ‘R’ and ‘B’ and offer some spectacular acrobatic moves, although they don’t help with the camera. Every map is a combo-based playpen and your hit count soon reaches into the thousands. Skill and Growth points earned from battle are used to strengthen your party in whatever way you see fit, and procured weapons can be sold for gems or dismantled into their elemental parts for use on other weapons. Defeating certain characters will net you specific gear for your team and there are numbers and gauges galore to tinker with as you gain XP and level up. It’s not presented in the most intuitive way, but anyone who’s played an RPG should be fine navigating the skill trees and cumbersome menus. The Japanese voice work is spirited, although parsing English text boxes that pop up during battle is nigh-on impossible while juggling hundreds of enemies. Team members can forge bonds by working together and you can watch their portraits talk to each other in bespoke interactions as their relationships blossom. Hardly scintillating, but serviceable. Story Mode throws new characters at you at a steady rate from an impressive total of 170. Franchise aficionados obviously have newcomers at a disadvantage here, and stalwart fans will no doubt be thrilled to see all these returning noble warriors; outsiders, on the other hand, may have trouble remembering who’s who. Which isn’t necessarily the game’s fault (after all, who starts a series at number four?) but the characters on the selection screen tend to blur together as the roster balloons. There’s lots of big armour; what’s a helmet without half-meter-long gilded horns, eh? Performance-wise, everything’s sharply rendered (a touch softer in handheld mode) and the framerate remains relatively steady in combat. There seems to be little in the way of obvious compromises for the Switch version, although that perhaps betrays a general lack of ambition; less pop-in and a few extra tufts of grass wouldn’t suddenly transform the visual experience. The soundtrack features some sweeping orchestral numbers but the bulk of the gameplay is accompanied by shredding guitars and/or electronica which doesn’t help shake the lingering monotony in other areas. It’s odd just how willful that repetition is, from the roster to the music to the mechanics. Everything about the game is undeniably one-note, turned up to eleven at all times. It makes us wonder how Musou would fare as a service. A whole raft of DLC is available, from special mounts and costumes to new scenarios, challenge modes and BGM packs. The gallery mode that you unlock after chapter 2 allows you to peruse character models in different costumes, change their expressions and listen to every line they utter. There’s plenty for fans to sift through. By snapping off the Joy-Con you can share the battle with a friend in local co-op. The controls scale down surprisingly well (although camera control is removed) and the gameplay arguably benefits from some camaraderie. Online mode was unavailable at time of review but promises action for up to 6 players, enabling you to create rooms or join friends by entering a seven-digit room number. Warriors Orochi 4 is, at times, pleasantly, commendably banal. If you let that overwhelming fountain of characters and narrative nonsense flow over you and simply settle into eliminating wave after wave of enemies, you begin to realise that the repetition is the point; it leads you to that mind-cleansing flow-state. It becomes more appealing as you improve and encounter even more enemies, but we struggled to stay on that heightened plane for long and it’s tough to muster enthusiasm for attacking another dull army in another dull fortress. “Wait a second,” we hear you cry. “Why did you rate the Hyrule and Fire Emblem Warriors so highly then?” It’s pretty simple; even though those titles also suffered from repetition, crossover from their respective franchises somehow helped overcome this issue, and, in some respects, new features helped improve the core experience (especially in Fire Emblem Warriors). 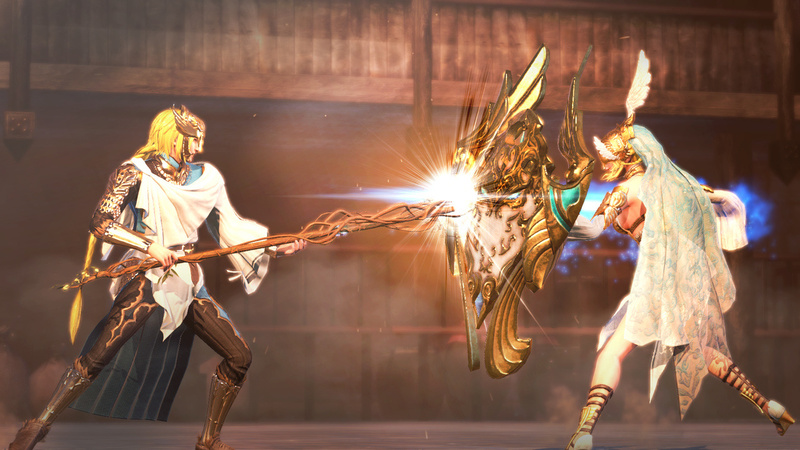 It’s not for everyone, but Warriors Orochi 4’s multitudinous hordes can be pleasurable to sweep through, despite the game feeling by-the-numbers in many ways. This is simply more, and while fans might be able to forgive the bland presentation, we’d wager that non-devotees would have a much better time with the Zelda or Fire Emblem spin-offs – with the characters, settings and accoutrement you know and love helping to temper the monotony when you’re not quite ‘in the zone’.